Casual computer users often give little thought to fonts, but once you starting working on design — from your web site to your stationary needs, you soon begin to appreciate the positive effects a good typeface can have on branding and marketing. 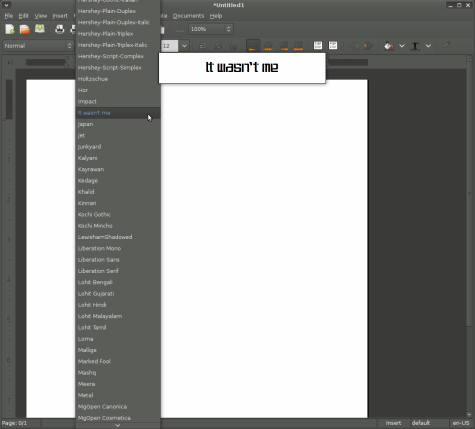 The trouble comes when you start to collect more fonts on your system than you can keep track of in your head. Worse yet, most operating systems attempt to manage fonts for you in an all-or-nothing fashion, through which large collections can slow down application speed, in addition to being tiresome to scroll through. The solution is a good font manager, like the open source Fontmatrix. On the whole, it is a good thing that the OS keeps track of fonts for the user — you generally want the same fonts to be available to every application on the system without having to worry about them individually, and you need to rely on them being loaded before you need them. Fontmatrix retains these nice properties; you can keep a useful set of fonts loaded all the time. What it adds is the ability to switch additional fonts on and off on-demand. Instead of a simple checklist, though, it lets you preview, tag and compare fonts side-by-side, see which languages and weights they cover, inspect individual glyphs, and even search for fonts based on supported properties. The latest release of Fontmatrix is 0.6, which you can download for Windows and Linux (Mac builds are periodically available, too, but might not be as up-to-date; you can always check the version number against the Linux releases). Linux packages are provided for OpenSUSE, Fedora, Debian, and Ubuntu. Check your distribution’s package management system first, though — most distros are supplying up-to-date Fontmatrix builds. The first time you run Fontmatrix, the program will recursively search through your system’s pre-defined font directories, such as /usr/share/fonts/, /usr/X11R6/lib/X11/fonts, and so on. You can add a directory, such as /home/username/myfonts/, by choosing “Import” from the File menu. This is handy for downloading individual fonts from the Web and testing them out. What you see when Fontmatrix is running is a directory-like tree structure on the left that lists all of the fonts on your system alphabetically. Each font family has an arrow next to, with which you can show or hide separate faces if they exist (Bold, Italic, Book, etc.). Select one, and you can browse through all of its details on the right-hand side of the window. 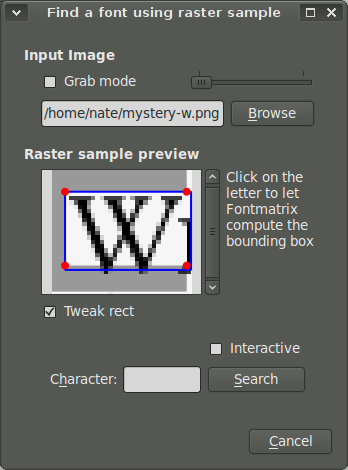 The “Font Information” tab displays metadata about the font, including its creator, license, version information, a URL, and any other information embedded in the font file by the font designer. The “Sample Text” tab, naturally, renders sample text in the selected font. 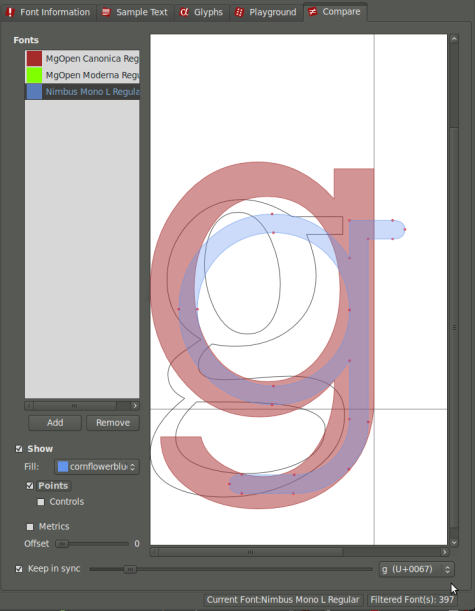 You can adjust the hinting parameters, left-to-right and top-to-bottom orientation (as appropriate for the language), and for OpenType fonts, enable or disable specific features, all to see how they affect rendering. The “Glyphs” tab is probably the most useful for font hunters working on a design; it shows a complete table of the font’s characters, sorted by Unicode code and grouped into Unicode blocks. 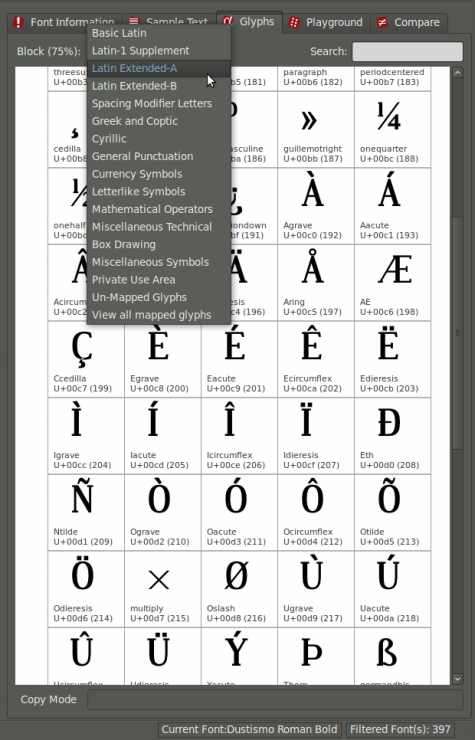 If you are working with a Latin alphabet language, you can scan through the “Basic Latin” block at a glance. If you need Cyrillic or Katakana, those blocks are available too, and Fontmatrix even tells you what percentage of the character block the font implements. You can click on a particular glyph to see it rendered almost full-window size, which can be nice for detail work. The “Playground” tab is a free-form canvas, in which you can type any text, at any size, in any font, and then rearrange the typed samples to your heart’s content. This is especially useful for seeing how different fonts work together in a design. Finally, the “Compare” tab allows you to overlay multiple fonts onto each other, fully aligned, to compare their glyphs in detail. You can color-code the font selections and scan through their entire character sets to see them in detail. You can optionally display the fonts’ control points and metric if those help — which they might; a particular font may have the “g” you want to use in your logo, but because of a funny baseline alignment, it doesn’t look right. The compare tab would help you spot this. As alluded to above, Fontmatrix can not only help you to examine fonts, it can simplify working with them by giving you better tools to manage your entire collection. The first way it does this is by permitting you to deactivate all of the installed fonts that you do not wish to use. If you maintain a large collection of “novelty” fonts used only for logo or letterhead design, for instance, deactivating them de-clutters the Font menu in your word processor, and speeds up how quickly the menu loads when clicked, too. You can deactivate any font by clicking on the checkbox beside its name in the left-hand-side font list. This deactivation only removes the font from the system’s current memory, though — it is not permanently uninstalled, and you can still access all of the relevant information about it in Fontmatrix itself. Fontmatrix also helps you to organize and sort your fonts based on your your own criteria, starting with simple tagging. You can tag each font with an unlimited number of plain-text string tags, and view portions of your collection based on tag sorting. The “Tags” tab at the bottom of the left-hand window pane exposes this functionality. In addition, you can explore fonts based on the PANOSE type classification system. PANOSE is based on a typeface’s visual attributes, such as serif style, glyph proportions, and stroke variation, not conceptual metadata such as “cowboy font” or “Italian pottery script” that font authors may use to describe their typefaces abstractly. As a result, it can be used to sort and search on even unknown type specimens. Recent versions of Fontmatrix build on this classification function to perform interesting functions, such as the ability to identify a typeface found “in the wild” by measuring its attributes and matching it against known samples. You can access this function through the Service menu, and load either an existing raster image file or a screenshot for identification. Obviously, the more characters are available, the better. 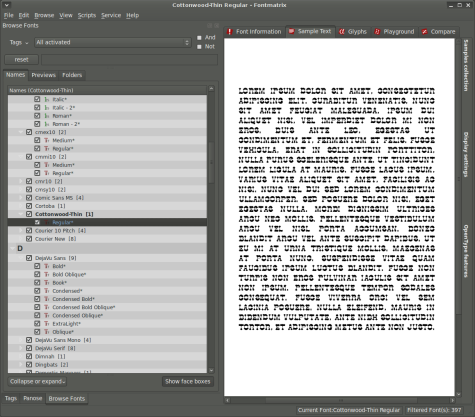 Fontmatrix can also extract the embedded fonts found in PDF documents (although only the subset of characters used in the document will be available), explore the full TrueType tables embedded in a .TTF font file, and enable or disable advanced features of Open-Types fonts on a per-font basis. This enables you to tweak OpenType font behavior, in areas from kerning to sub-script and super-script placement. Undoubtedly, Fontmatrix incorporates a swath of features that cater to the typography fan, but its real value for the everyday user is in simplifying the creative workflow. If you are working on branding for your business, using Fontmatrix to help you find the perfect typeface for the corporate initials is far easier than trying all of the combinations with trial-and-error in Inkscape. But more importantly, the remained of the work week, Fontmatrix lets you work faster by performing the unsung task of keeping those application font menus nice and tidy. This entry was posted in Labels & Printing, Open Source on June 25, 2010 by wlmanager. This sounds most useful. Does it work on Windows 7? i extracted some subset font .pfb from pdf file, but only read with font matrix, not read with another sofs like ATM, main type,X-fonter, cross font.Also can not open in fontlab,High-Logic FontCreator. I want add some char in this font and use.May who help me? The program is not very good or intuitive. 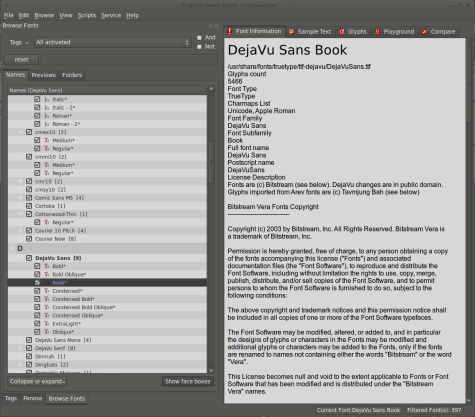 If you want a good AND intuitive font manager for Linux, you’ll have to wait.